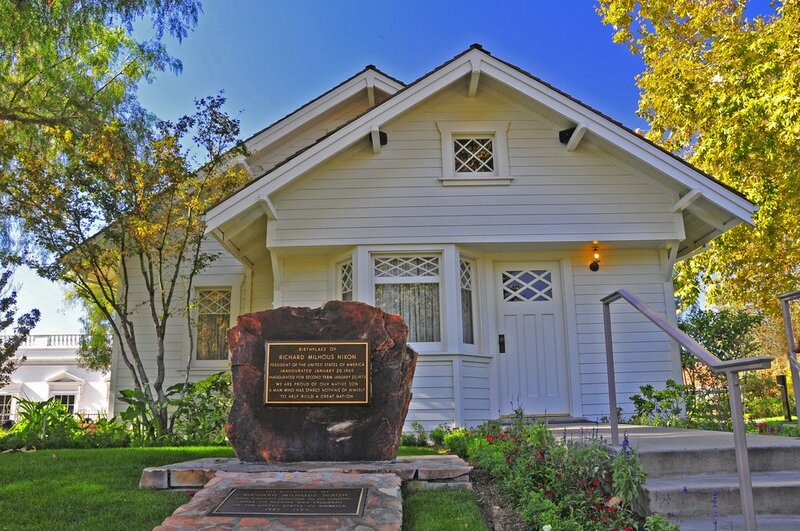 The most famous mail-order house is former President Richard Nixon's birthplace in Yorba Linda, California. It's a National Historic Landmark and a California Historical Landmark. Richard Nixon's father, Frank Nixon, built the home in 1912. Frank was a very accomplished carpenter who helped to build many homes in the towns of Yorba Linda and La Habra. Richard Nixon was born in the home in 1913. The Nixon family lived in the 900-square-foot house in Yorba Linda until 1922. Then the family moved to nearby Whittier, California. Nixon's birthplace. This is the back of the house, but the most well-known view of the structure since it faces the Richard Nixon Presidential Library and Museum. Nixon insisted that the house not be moved from its original placement. Photo courtesy of Wikipedia. Since its opening in 1990, the Richard Nixon Presidential Library and Museum has attracted nearly 2.6 million visitors. The birthplace is the most popular attraction. Front of the Nixon home. Photo courtesy of Keung Luke. "I really can tell you it's the most popular thing we have here at the Nixon library because everyone falls in love with this little house that my grandfather built from a kit. And, Huell, I'm hoping that some of the viewers might be able to help us because we've done research and we know it's not a Sears & Roebuck or Montgomery Ward kit but my Grandfather Nixon ordered this kit from a catalogue and he put the house together. "And so we haven't been able to document which one, so maybe it'll look familiar enough to some of the viewers." "So Frank Nixon literally went through a catalog. And it wasn't a Sears catalog and it wasn't a Montgomery Ward catalog. We still don't know the identification of the manufacturer of this wonderful house but we know that it was a kit house. So he actually took his horse and buggy and drove it to the train station. There's actually a section of the train still there on Imperial Highway that you can see. Frank Nixon brought these boxes and crates back to this Yorba Linda site and he built this wonderful house." The home's site was less than a mile to a train line. Although Yorba Linda had a population of around 200, in 1911 the Pacific Electric Railway Company extended its service to Yorba Linda and built a depot. Fruit was shipped out from Yorba Linda, while lumber and other materials were delivered there. How Do They Know it was a Kit House? Before 1990 there were no references to the Nixon birthplace being a kit home. Even the form used to nominate the Nixon birthplace into the National Register of Historic Places does not mention that the house was built using a kit. "We know from President Nixon that his father, Frank Nixon, purchased a home kit and had the lumber delivered by train to build a house here on 8.2 acres of land--the land was purchased by Hannah Nixon, the President's mother." The renovations begin in 1989. The total cost was about $450,000. Photo courtesy of Associated Press. As the birthplace was being renovated, Nixon and his family were actively involved in the process. According to an article in the Los Angeles Times from 1990, members of the firm that restored the birthplace "relied heavily upon advice from the former President." They conducted a three-hour meeting with Nixon about the history of the house and specific details he recalled from his childhood. It appears that during these meetings, Nixon recalled that the house was a kit home, but he did not know what company manufactured the home. Although many Internet sites maintain that the Nixon birthplace was a Sears house, it was not. None of the known Sears models offered in the 1911-1912 time period looked anything like the Nixon house. The Nixon home in 1969. Photo courtesy of the National Park Service. None of the known Aladdin models offered in 1912 looked anything like the Nixon house. I contacted the Clarke Historical Library, which houses the remaining Aladdin sales records, but they unfortunately don't have records for 1911 or 1912. The Pacific Ready Cut Homes factory was in Los Angeles and they started selling "ready cut" houses around 1908. Unfortunately the company's sales records have been lost and we don't know what the company's models looked like during that period. Due to a scarcity of documentation from these manufacturers, we're at a dead end. The Richard Nixon birthplace has been fully restored on the exact spot where Frank Nixon built it. The exterior of the house remained unchanged through the years, although many changes were made to the interior. The Richard Nixon Foundation restored the interior to the time when Nixon was a young boy. Most of the furnishings are original, including the bed where Nixon was born, the highchair he ate in as a baby, and the piano on which he took lessons. The house was placed onto a new foundation to handle the influx of visitors. Because the exterior of Nixon's childhood home looks exactly as it did when it was first built, this may ultimately be the clue needed to identify the manufacturer. If someone can find an identical kit house in California or elsewhere that has definitive markings or documentation that indicates the manufacturer, we can finally solve the mystery.